Happy Gram - Presencia Must Go! 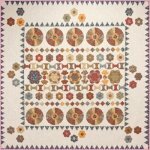 Duke Road is a fun English Paper Piecing project offered as a 10 month Block of the Month. Finishes 60" square, you'll love this row quilt by Sue Daley. Get started today! We are clearancing our Presencia threads. All Presencia floss and perle cotton size 8 and 12 are marked 50% off! We need to move them out to make room for new and exciting threads. Hurry in to get the best selection. Harriet Hargrave is making her annual trip to Historic Downtown McKinney this September to teach three of her classes. More class details and supply information can be found online. Sign up now as classes are filling up quickly. The 3rd Annual Quilt Across Texas is just 10 days away. Make sure you have your passport because the fun begins September 1 and rolls through the entire month. We are in Region 2 this year with 14 other stores. We think our region is the best in Texas because we have the best prizes. At each Region 2 store, you will receive a different collectable Villa Rosa pattern when you get your passport stamped. First Sunday Social is this Sunday, Sept. 1! It's western themed to coincide with Quilt Across Texas. You'll need to bring scissors, a big sharpie, and stapler for this month's make it take. It's adorable! Also, please bring 3 quilt shop quality fat quarters to play Left, Right, Center. We're collecting school supplies this month and for each package you bring, you'll receive 1% off your purchase up to 10% off! So, boot scoot on over this Sunday, rope yourself some good deals, and have a rip roarin' good time!